There is a constant debate in our house re: *Vegemite *vs. Marmite. Any Aussie living with a Brit will probably have the same debate over and over and over again. 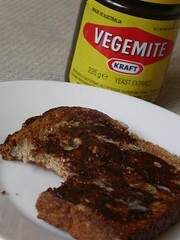 Anyway, I do like Marmite and there is a place for it’s sticky, sweetness but I always go back to Vegemite as my spread of choice for breakfast. If you’re not sure what it is, it’s a yeast extract spread that is mostly used for spreading on toast or bread but I also use it like stock for chili or spaghetti bolognese. It’s also a good source of folic acid. 10 years ago it was harder to find but most of the UK leading supermarkets keep it now, yay for me!